A must have to extend your keyboard! The perfect accessory to complete your workspace. Featuring a full keypad with number lock, the Wireless Numeric Keypad is a great wireless solution for extending your existing keyboard. Not only accountant, every notebook or laptop pro will become dependant on the numeric keypad once you have tried it! Use it, you will find your work effciency and productivity will be improved greatly! 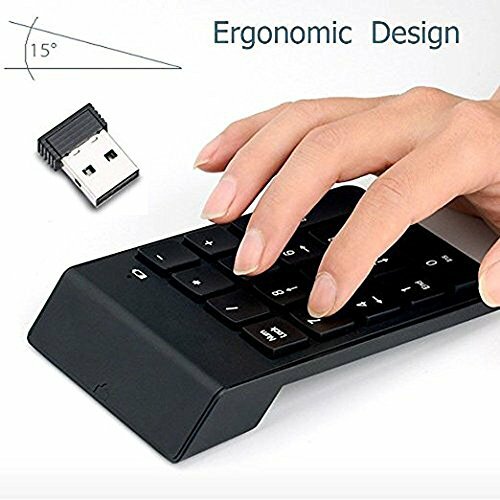 1.Febite keypad is compact and comfortable to use,Wireless transmission is very convenient to USB receiver plug and play,laptop numeric keypad can be used with this key pad at same time,easy to carry. 2.18 function keys have complete control function,Use 2.4G frequency band, have opened a key to open the keyboard,and there are LED lights flashing mark. 3.The keycaps life of more than 10 million times.Operating Current: 5mA (MAX) Sleep Current: 0.5mA Effective Distance: Approximately 32.8FT Accessibility. 4.Need to master the keyboard keypad switch，If the battery is less than 1.1V,the LED indicator light alerts.No Power Button Needed,Use 1*AAA Battery【Note: Battery Not Include】. If you have any questions about this product by FeBite, contact us by completing and submitting the form below. If you are looking for a specif part number, please include it with your message.